What does the current Series 7 Exam look like? According to FINRA, an individual registered as a general securities representative is permitted to solicit, purchase, or sell all securities products, including corporate securities, municipal fund securities, options, direct participation programs, investment company products and variable contracts. Prior to October 1, 2018 current registration candidates must pass the Series 7 exam by demonstrating they possess the knowledge needed to perform the five main job functions of a general securities representative. Candidates have 360 minutes to answer 250 multiple choice questions, and the exam requires a passing score of 72%. All individuals engaging in the securities business will be required to take the SIE exam as of October 1, 2018 (not just Series 7 candidates). It will assess common securities industry knowledge and general concepts and will focus on industry terminology, securities products, the structure and function of the markets, regulatory agencies and functions, and regulated and prohibited practices. 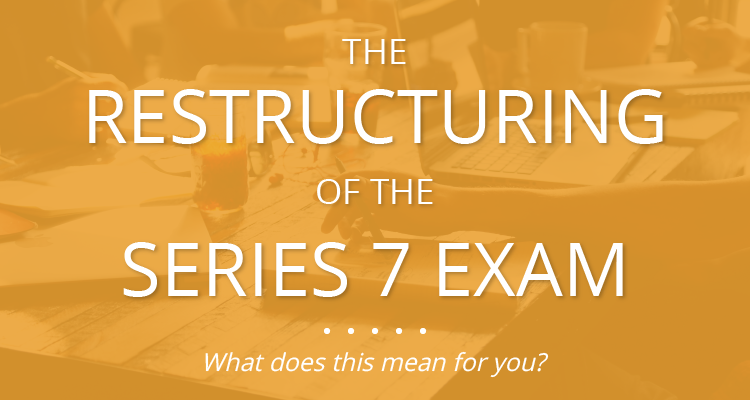 How will the Series 7 Exam be restructured? Because of the new requirement and creation of the SIE exam, the Series 7 representative-level exam is being restructured and will be referred to as a “top-off” exam. With the SIE exam being structured to assess general securities industry knowledge, the restructured Series 7 representative-level exam will have fewer questions and a more in-depth focus on four main job functions as a general securities representative. FINRA recently released the exam restructure and specifics. The new Series 7 top-off exam will consist of 125 multiple choice questions, allow the candidate 225 minutes to complete the exam, and will be scored using equating.